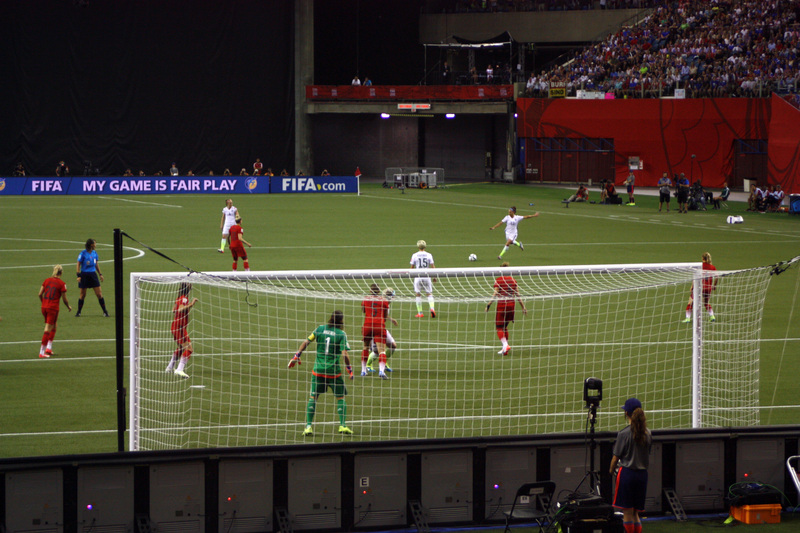 So as part of my vacation last week, I got to attend the Women’s World Cup semifinal in Montreal between the U.S. and Germany, which was kind of a good game. Since the Women’s World Cup isn’t nearly as big of a deal as the Men’s World Cup (because, duh, girls), the tournament isn’t occasioned by the construction of massive new stadiums that nobody will ever use again, but rather is played in whatever stadiums the host nation already has available. For the U.S.-Germany semifinal, this meant Montreal’s Olympic Stadium, the erstwhile Big Owe that helped drive the Expos out of town. I’d been there once before in 2001 for an Expos game, and found it to be a weird place to watch baseball, though mostly because baseball in a cavernous indoor space with only a couple thousand fans is always going to be weird. Since the Expos left, it hasn’t been used for much — Alouettes playoff games, Impact spring games when the weather is too awful to go outside, occasional concerts. Now, I honestly don’t know whether the near-complete lack of activities (a feeble fanfest finally opened a couple of hours before the game) was because FIFA doesn’t care about women soccer players unless they’re wearing hotpants, because vendors were all busy with the Jazz Fest across town, or because of some traditional Quebecois aversion to providing timely service. But the point is that there was nothing wrong with Olympic Stadium that some better concessions options (and turning over more of the washrooms to women — predictably at a women’s sporting event with half men’s rooms, the women’s room lines were appallingly long) wouldn’t have fixed. Some renovations and a more attentive concessionaire (there were no USA player t-shirts on sale anywhere, which at most stadiums would be enough to get your marketing director fired, then rehired just so that you could fire him again), and Olympic Stadium would still be far from modern, but would be a perfectly okay place to watch a sporting event. And that’s at a stadium that is perpetually ranked among the worst ever. Consider, then, to what degree bad management and disinterest in upgrading a facility that you want out of anyway contributes to the flaws that are being perpetually trotted out in support of arguments that pretty much any stadium over 15 years old is ready for the junkpile. The fact of the matter is that if the game is fun, it’s going to be fun pretty much anyplace; and if it’s not fun, a ride on a baseball-shaped Ferris wheel can only do so much to save it. Anyway, soapbox off. Suffice to say that I went to a soccer match at what is rightfully considered one of the worst stadiums ever built, and had a great time. It seems like there should be some kind of lesson in that.